I am pretty sure it is a Cypinidae and this is an excellent short of emerging young (Kinsey would be proud). It isn’t the Oak-apple gall wasp is it? If it is then that round thing is the gall resulting from egg-deposition from an adult. The gall was originally formed when a wasp, such as a live oak gall wasp, deposited its eggs under the bark of the tree, triggering the formation of the gall. Those eggs then hatched into a larvae which developed in the gall and fed on the tree. 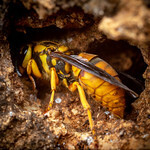 However, this well stocked fortress is a perfect target for other parasitic wasps, such as one or possibly both of those wasps pictured, which would proceed to inject their eggs into the gall, where they would hatch and eat the previous inhabitant. A sort of parasitization of parasites if you will. Even a herpetologist says it’s a gall wasp on a gall. Geez, I can never beat the stampede! Yes, the object is a gall caused by a cynipid gall wasp. Live oak doesn’t occur in Illinois, but it is definitely oak of some kind (perhaps pin). One of those wasps is the cynipid gall maker itself emerging from the gall, while the other I presume is a parasitoid of the cynipid – but I don’t know which is which (so I guess no points for me there). To redeem points, Alex will mention your blog daily for a week. I’m going to go out on a limb (ha!) and say it’s an round bullet gall, not apple…the apple galls (Amphibolips spp.) generally form on leaves, and this one looks like it’s on the twig-Disholcaspis quercusglobulus? 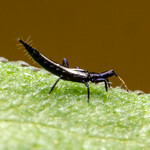 The other is an inquiline…it may not actually directly parasitize the original occupant of the gall…the larva could either feed on the gall tissue or it could smother the original occupant of the gall. I don’t know the correct names for many galls, but I agree this one looks like a gall on a twig, apparently on Quercus bicolor. A gall, a gall wasp and it´s hyperparasitoid. Here’s a hint: Both wasps are ovipositing. Both chalcidoids of some sort, then? Oh, well if they’re both ovipositing, then they’re both parasitic/inquillinous on whatever that gall is. They both look like cynipids to me.